Yesterday I attended a seminar at the 2015 PATH Intl Conference by Marny Mansfield and Emily Wygod of Endeavor Horsemanship called “Step Up the Approach” about stepping up your approach to instructing. They had this great handout of an example lesson plan, with a video of the instructor teaching the lesson, and then we discussed it. With their permission I get to post it here, and will share the comments about how the lesson went, because I think those are just as valuable! Enjoy! Riders will demonstrate lengthening of their horse’s stride two times and shortening of their horse’s stride two times at the walk between a set of ground poles. When the horse lengthens each stride/step to cover more ground. Horse’s movement should feel larger and increase the rider’s hip/seat motion. – not the same as going faster. When the horse shortens each stride step, to take smaller/more steps. Should feel less movement. – not the same as going slower. Lengthening teaches our horse to move off leg, and push from their hand end. 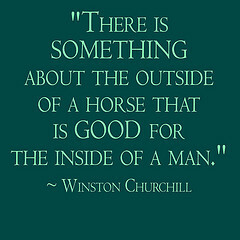 Encourages more engagement/movement, and prepares our horse for more advanced movement. Shortening helps control our stride better to collect our horse. Very useful when jumping. Riders will feel the beat of the horse’s walk by dropping the reins and placing hands on shoulders, and then haunches. Riders will count the 4 beats of the walk. Leaders will ask horse to take bigger steps and then smaller steps for riders to feel the difference. In the lesson she had them put their hands on the horse’s shoulders, count the beat, then had the leaders lengthen then shorten the horse’s stride with the rider’s hands still on their shoulders. Riders will walk down centerline through [the 2 ground] poles and count out loud how many strides they feel at a normal walk. Each rider will go through 2 more times, and increase then decrease the number of strides, changing direction after each turn. Posting trot (to better feel change of rhythm between lengthening vs. shortening) down long side in each direction – riders will concentrate on shortening horse’s stride before coming back down to the walk. “Passing Game” (if time) – riders will walk in single file line; close but at a safe distance from each other. 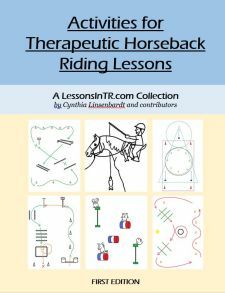 Rider in the back will ask horse to lengthen stride in order to pass other horses and move to front of line. Other 3 riders will practice shortening their horse’s strides to let the rider in back pass. As each rider passes, they will say “inside” to let other riders know they are passing. Interspersed comments and explanations throughout the lesson so it wasn’t one info big dump. Working on both shorten and lengthen is a lot for one lesson – just focus on one. Unless she just wanted them to focus on the difference. Didn’t teach to the highest level, taught to two less experienced ones and didn’t include third better rider until the end. Could have had better rider demonstrate skill to other two. Trotted late – could have used it earlier to engage everyone, then she wouldn’t have had to talk so much.